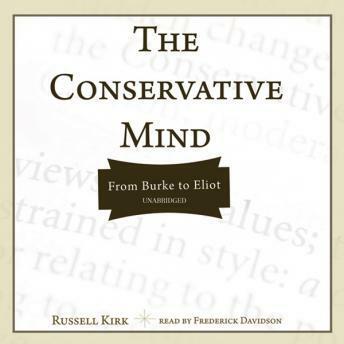 Listen to "The Conservative Mind: From Burke to Eliot" on your iOS and Android device. First published in 1953, this magnificent work will be remembered in ages to come as one of our century&apos;s most important legacies. Written during a time when liberalism was heralded as the only political and intellectual tradition in America, there is no doubt that this book is largely responsible for the rise of conservatism as a viable and credible creed. Kirk defines &apos;the conservative mind&apos; by examining such brilliant men as Edmund Burke, James Fenimore Cooper, Alexis de Tocqueville, John Quincy Adams, Nathaniel Hawthorne, Benjamin Disraeli, Cardinal Newman, George Santayana, and finally, T.S. Eliot. Vigorously written, the book represents conservatism as an ideology born of sound intellectual traditions.